So that's how it goes when you go shopping with big girls. I was lamenting that my feet hurt, but I didn't have any other shoes, so there was nothing I could do about it. They told me to buy new shoes. They were right. I'm quite pleased with them. 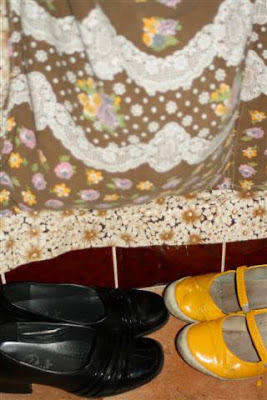 And since I was focusing on the subject of shoes (I don't very often), I was seeing shoes and the stories they were telling me all over the house. Problably kicked of while doing dishes. There always shoes lying around where they don't belong. One of the girls loves ballet. And I get to sew on the elastics on her shoes. ButI don't mind, really. Youngest. Her old shoes on the right, new on the left. Growing up so fast. Looking for a quite space.